When decorated for Christmas, The Old Edwards Inn & Spa has a magical glow. My dad wearing earbuds and listening to football games; friends and family thought it anathema we would dare to marry on a college gameday Saturday! One of my bridesmaids forgetting her shoes. 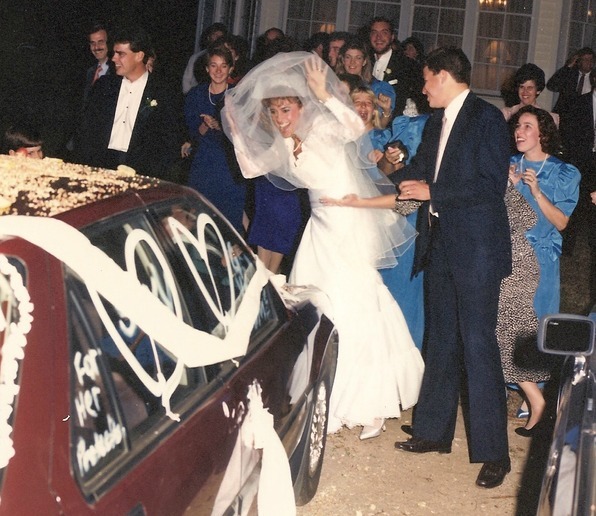 Ohmylanta–this was back in the day when brides had shoes dyed to match bridesmaids’ dresses (which, of course, we swore “you could wear again” but never did). Let’s perish that thought (and practice! ), please. The entire day feeling out of body, like I was a spectator to my own wedding. Arriving at the Hyatt Regency in Greenville in my wedding gown for our first night as husband and wife. Though I was self conscious at everyone staring, I loved my outfit begged the world’s notice that this was the most special day of our lives. The next day we drove to the Old Edwards Inn in Highlands, North Carolina, where we would spend the next two nights of our honeymoon. Anchored to the corner of streets Main and 4th, Old Edwards Inn was a quaint, upscale inn opened in the 30s with roots even older than that. It changed hands multiple times before Rip and Pat Benton bought and remodeled it in 1982.
but hardly what it has become today…. And many more awards and accolades. 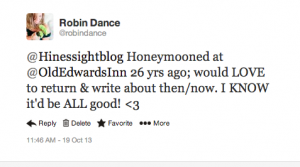 The next thing I knew, I received a Direct Message from the Old Edwards Inn, and not long after that we were on our way to an amazing second honeymoon. 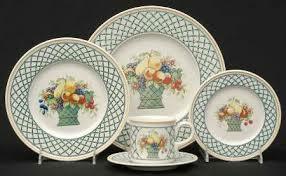 Their Central House restaurant used Villeroy & Boch’s Fruit Basket china, which I loved and had almost chosen for my everyday china (it was too pricey to register). 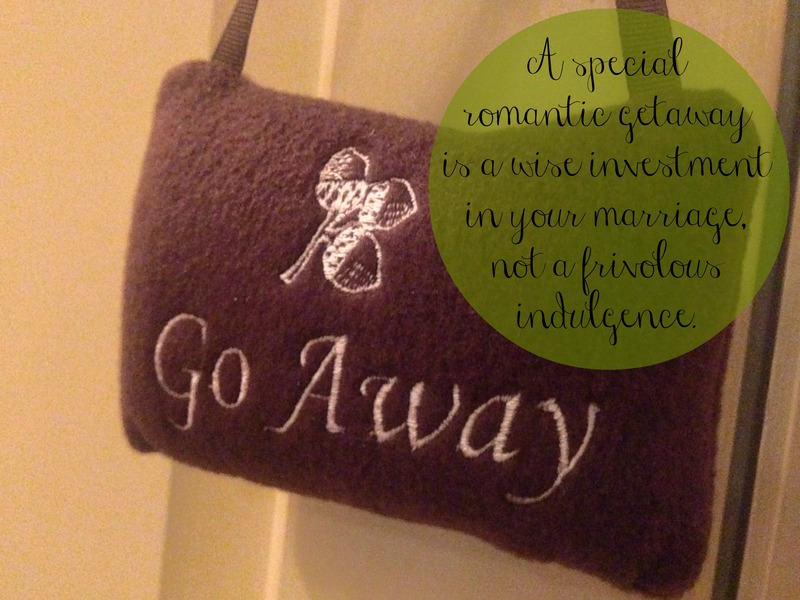 I considered it a honeymoon God-gift and “good sign” to see them using it. Their walls featured award-winning stenciling. Anyone remember when stenciling was big? Apparently it was. Not all of the rooms had showers; we had to specifically request a room with one. I was tan and had permed hair. Two poor personal choices; nothing to do with Old Edwards Inn except I remember :). My hair wasn’t that short; I think it was still French-braided from the wedding. 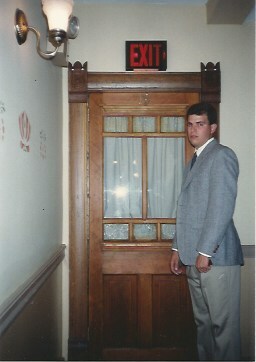 While baby face handsome, he looks thrilled standing guard over Room 19, yes? His mighty affection for the camera has followed him to this day. 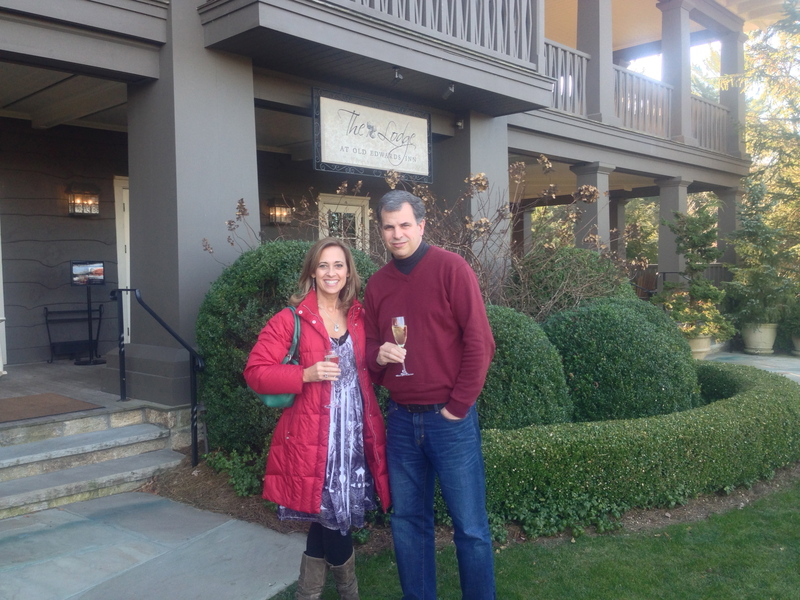 Our 26th anniversary will be one of my most memorable ever specifically because we spent it at The Old Edwards Inn and Spa. No tan, no perm, and look–he’s smiling! What a difference 26 years makes! the rack rate and 20% off spa treatments during your stay! Mention Robin’s Romantic Getaway when you make your reservation. The Old Edwards Inn and Spa is special, and soon enough you’ll see why. Most people can’t afford frequent visits to a resort this nice, so for me to strongly encourage a visit here says a lot about it. It’s not frivolous spending, it’s not opulent indulgence; what it is is an investment in your marriage and prioritizing the most important relationship in your life. 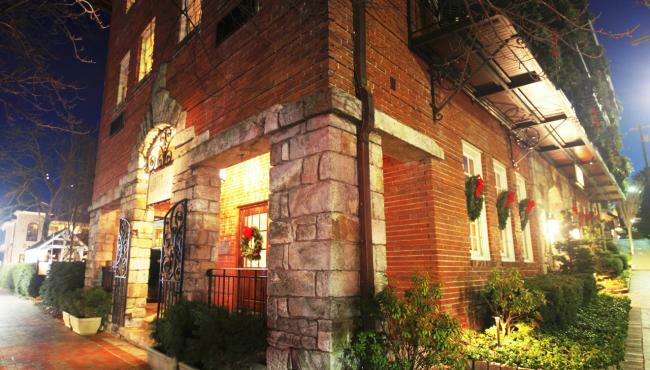 Husbands, if you’re looking for the best Christmas gift you can give your wife (even if it is a last-minute idea), surprise her with reservations to Old Edwards Inn and Spa sometime between January and March. 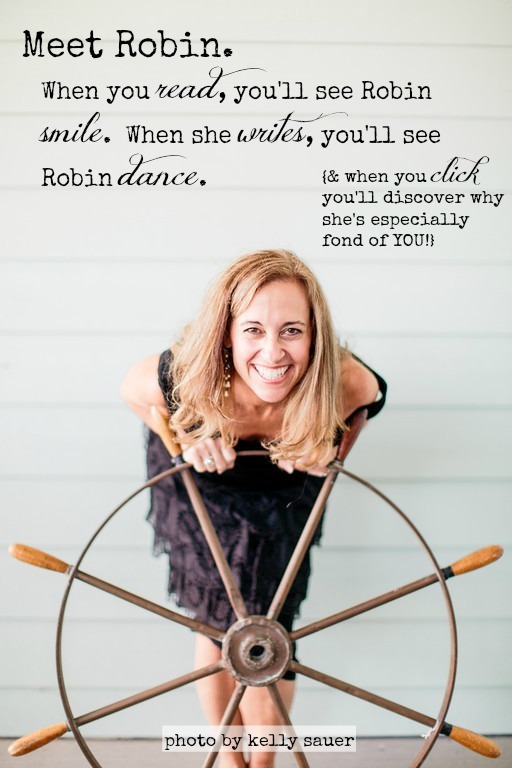 Ask for Robin’s Romantic Getaway and you’ll receive the lowest price of the year (I don’t receive compensation for sharing this offer, but it’d thrill me to the moon to convince a few of you to Just Do It!). Please check back tomorrow when my pictures will speak thousands of words. Once you see more of Old Edwards Inn and Spa, you’re going to be saving your pennies to get there! With great thanks to the Old Edwards Inn and Spa for our complimentary stay and for every single staff member we met treating us like royalty. We’re already saving now for a future return. Vacationing and sightseeing are not the same thing. A good vacation has medicinal value balming soul and spirit with rest and relaxation; a fun sight-seeing trip broadens experience and brings to life the places otherwise relegated to a book's page or a World Market canvas. A bad either one of those can breed frustration, flat wear you out or give you legitimate reason to sell your kids to the circus. Eight years ago we packed up our kids, loaded up the van, and made the nine-hour trek to Washington, DC. Clearly, this was not a vacation. DC is an amazing city, and after visiting many times before we had children, we couldn't wait until they were old enough to go. At the time they were 13, 11 and almost 9, the perfect age for a visit–old enough to log a thousand miles on foot without excess complaining and potentially able to remember what they had seen. 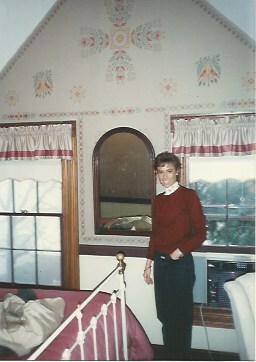 Between three kids in a private, Christian school at the time and my husband earning our only income, money was tight. We made the decision to share one hotel room among the five of us. Lest you get the wrong idea, this was no fancy schmancy suite-hotel. We had two queens (fulls?? ), a lop-sided roll-away and a single, small bathroom. The city's vibe may be all power and seduction, yet D.C. is a wonderful family destination. Entry is free to most museums and there is nothing compared to standing in the very spot at the Lincoln Memorial where Dr. Martin Luther King delivered his "I have a dream" speech or swaying at the top of the Washington Monument. I'm sure I felt it. After four days of touring every monument and museum in the city we headed home, exhausted but happy. As is often the case on road trips, I fell asleep not long after we were on the road. My husband takes that bullet for me, driving the majority of the time. What may be a control thing for him is sweet gift to me. By the time I woke up, the kids were asleep, a perfect time for uninterrupted, adult conversation. Though we had been together constantly during our trip, my husband I were missing each other. Being jammed in a hotel sardine can doesn't make for many romantic moments. What he said next is one of those things I've never forgotten, the kind of thing that fans flame in a quarter century-old marriage (though at the time, we had been married 18 years). "I had a chemical reaction to you." My cocked head and squinchy eyes asked him to explain, so he did. "When I looked at you while you were sleeping, my body reacted to you. I looked away, then looked at you again, and the same thing happened." Quite possibly, no sweeter words the man has ever spoken. Yet, without a word, without a touch, the very sight of me stirred something within my husband that attested to his affections for me. If that isn't testimony to the power and the wonder of a woman, I don't know what is. to the power and beauty of your relationship? Thanks for following along with our #31Days exploration into the Wonder of a Woman. Please click here for further explanation and a listing of all posts to date. The Collegiate Church of St. Peter, Westminster, aka Westminster Abbey, coronation church since 1066. Even if you knew nothing about its impressive history, its magnificent architecture would bow your knee in praise to the Creator who gives men the mind and vision to build such a vessel for worship. We passed Westminster Abbey several times during our 25th anniversary visit to London, and everytime my heart leapt in adoration of its beauty. My appreciation and love of architecture has sprouted and bloomed while living in Europe; I find myself wanting to study and learn and know more than I ever knew was knowable. Their website tells me Westminster Abbey has hosted only sixteen royal weddings in its long history, the most recent of which is Prince William's and Kate's. I assumed Prince Charles and Lady Di had married here as well, having forgotten they chose St. Paul's Cathedral since it could seat more guests and allowed a longer procession through London's streets. We were blessed with two days of blue skies and one of clouds, fog and rain, and I was intrigued to observe how different the same buildings presented under such contrasting canvas. The weather made a difference in more ways than one. 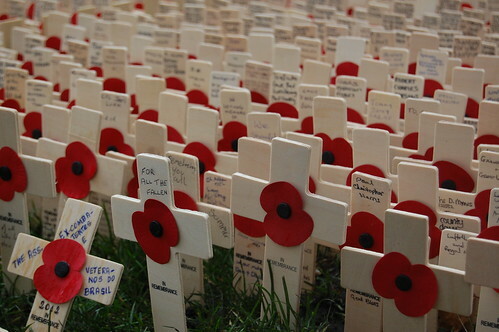 We happened to be in London for Remembrance Day, the equivalent of the U.S.'s Veteran's Day. Beyond the miles of parading military personel, including the Royals in motorized caravan, a lovely commemoration was the red poppy everyone wore on their lapel. National pride can be a beautiful thing. 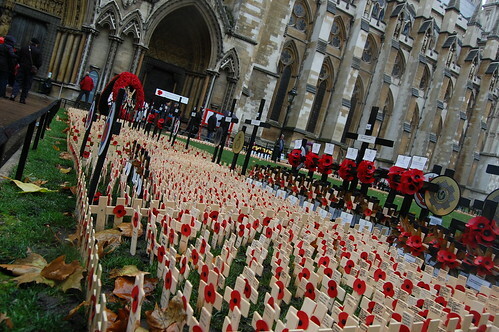 Thousands remembered in front of Westminster Abbey, a reminder to the high and dreadful price of war. More posts to come…London is a beautiful muse. Based on how old I feel, to be celebrating my 25th wedding anniversary I must've gotten married when I was 13. In fact, if it wasn't the case the year following my silver anniversary I'll be celebrating my golden birthiversary, I'd swear it. In lieu of exchanging gifts (and to take advantage of the closeish proximity of living in Germany), my husband and I decided to make memories. In London. I had no idea how much I'd love it. I know for many people, London is at the top of their Travel Wish List; but for some reason, it wasn't on mine. I'm not a Royal watcher, I didn't get up at dark-thirty for Kate and William's wedding (though I have to admit I watched Di's and Charles' back in the day), and I couldn't have cared less about seeing Big Ben or Westminster Abbey or the Tower Bridge. What the heck was wrong with me? It was frickinfrackin spectacular! It only took a walk a few hundred yards from our hotel and I was smitten–London's Natural History Museum was ~that close~ followed by the Victoria and Albert then Hyde Park and Harrod's and Piccadilly Circus AND OHMYWORD WHYohWHY had I not been doing everything I could to get there?! Ignorance, in this case, was not so bliss. It was kinda stupid. Anyways, in upcoming posts I'll share more of our sights, but for now a series of doors on a solitary street, somewhere between King's Cross Station (where Harry Potter would crash through Platform 9¾ to catch his train to Hogwarts) and the British Museum. I was drawn to their color and whimsey, not just in the painting of wood but also in the patterned tiles leading to entry. Sometimes basic black isn't basic at all. I absolutely LOVE the tile in this one, complimenting the coral door and avocado trim. And the yellow leaves need to remain there all year! Checkerboard tile makes me wanna sit and play. Simple and striking. Isn't it amazing how a subtle rotation of the squares turns this from checkerboard to houndstooth? J'adore! Understated color; overstated tile or just right? This one conjured thoughts of Tin Man. It almost scared me as much as flying monkeys. Again, basic and black and OH so beautiful! Thanks to my friend Lisa for inspiring me to share something as simple as this. The doors she photographed are much more diverse, likely because they weren't all located on the same street! If you have a favorite, shout it out in comments! I'm curious if one is more popular than the others. Wanna guess what mine is? how do you know you've arrived? better plans make for better trips. 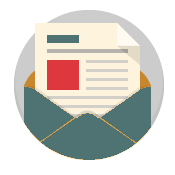 I'm not saying a daily, detailed itinerary with all time accounted for is necessary; rather, that you've evaluated the information gathered during your research and you have a good idea in advance how you'll spend your time. 1. Involve your co-travelers in making decisions. The people you're traveling with, be it children, spouse or friends, will better enjoy their time if they're actively involved in the planning. I've been surprised to discover the things I've most wanted to see or do don't always line up with my husband and/or kids. 2. Take advantage of Trip Advisor, Viator and Booking.com. These sites have reliable information and ratings by other customers JUST LIKE YOU; plus, it's also possible the sites will save you money. We've used them in choosing specific hotels, buying tickets and narrowing down what to do. For example, when we've located a great hotel deal on booking.com, we cross reference it with Trip Advisor reviews; what people have to say–good or bad–will impact our choice. 3. Familiarize yourself with public transportation. Especially in larger cities, public transit really is manageable. Reviewing subways and bus lines in advance minimizes the intimidation factor. A quick google search will provide this information (or if you've purchased guidebooks, they're likely to have a small one). You'll save money over taxis and time over walking. 4. As soon as you arrive and drop off your bags, if it's available, invest in a hop-on/hop-off bus ticket. A friend recommended this to us in Paris, and I strongly recommend you do this first thing; making the complete bus loop helps tremendously in orienting yourself to a larger city. To me, the benefits far outweigh the cost. Often, it's very cheap to add the second day and if the stops are where you want to go anyway, it's win-win. 5. When possible, buy advance tickets. Have we done this? No. Have I wished we done this? Time and again. Buying advance tickets will save you time and money if the destination is at the top of your list (be sure to check Viator.com for discounts). Lines are often long at top tourist sites and no one wants to waste valuable time. Also, if the place doesn't take e-verification and your hotel doesn't have printing services, you'll be glad to have tickets in hand when you arrive. Be careful buying advance Theater ticket through "discount" agencies; often, they offer no savings at all. When possible, buy those directly from the box office. 6. Remember the downside of travel guides. If Rick Steves , Fodor's , Frommer's or DK Eyewitness Travel Guides suggest it, everyone else and their brother will be doing it, too. The tips are typically sound and good advice, but you aren't the only one taking it. Don't be afraid to take the off-beaten path; little known secrets will be treasures from your trip. 7. Pack your suitcase. Then take half the stuff out. Mercy. Someone teach me this one! You will NOT need most of what you want to bring; this goes for backpack contents when flying, too. LESS is always the better choice. I was most impressed with my sister and brother-in-law who came for a two-week visit this summer; both of them brought only a carry on bag and backpack! Their light load made it much easier to navigate their three-city trek through Italy after their visit with us; if only I had that gene. 8. Always, always, always bring at least a light-weight rain jacket with you! I'm convinced all of Europe likes to make fun of tourists by tricking us constantly with weather changes. The forecast rarely matches the actual weather; and, I kid you not, on multiple days where sun was forecast with ZERO PERCENT CHANCE OF RAIN…it rained. Even if your morning is bright and sunny, take rain gear or be prepared to buy it. Mark my words…this point will be the most important travel tip you'll take away from my series. You'll be thinking, "I can't believe I didn't take Robin's advice," when you're sloshing though that unexpected rain shower. One of my favorite pictures from Paris–my daughter was sneaky with this one! Though we have a local bank account while living in Germany, we've found the easiest and CHEAPEST way to get Euros is by using our American debit card at most any local European ATM machine. When you arrive at your destination airport, you're going to need the local currency of the place you're visiting if they don't use U.S. dollars (snacks, taxis, shuttle services, bathroom, etc.). Before you leave home, the least expensive way of doing this is through your local bank (beware–not all branches will be able to accommodate your request), but there'll be a fee. If you wait until you arrive in country and exchange dollars at the airport, you're going to pay a higher fee. We've visited France, Italy, Austria, Switzerland and the Czech Republic and have always been able to withdraw cash from their local ATMs. IMPORTANT: Many restaurants and smaller hotels will take ONLY CASH; but for those times you'd prefer using a credit card, be sure to call before you leave home to have it released for International use!! At a minimum, you're going to need adapters; if you use rollers or a flat iron, you'll likely need a transformer. You can't count on your hotel to have either (though many will). Remember, too, that if you're traveling with family, you'll need several adapters; otherwise, you'll have to take shifts during the night to plug in chargers :). Make sure you bring along battery chargers for phone (did you get a temporary International plan? ), camera, laptops and tablets; bring extra memory cards. Your turn: Questions? What tips am I leaving off? Your suggestions might be fodder for an upcoming post! And thank you, always for sharing and Facebook likes–it lets me know you're reading (and I'm grateful). See the red logo at the top of the sign? My word, if you look at an aerial view of the Jewish Museum, you’ll discover the logo IS the museum! Brilliant, zig-zag design from architect Daniel Libeskind; the museum’s exterior, interior and flow from room to room are all art themselves. Remarkable. Housed in two buildings, Libeskind’s and the original Berlin Museum, 2,000 years of Jewish history fills 161,000 sf. Entering through Berlin Museum’s baroque wing, visitors can only access the new section through an underground passageway. We toured for a few hours; too long for my teenage children, not near long enough for me. The Jüdisches Museum is huge and interesting and educational and amazing; go for a few hours or for the day, but GO if you’re in Berlin. Billing itself as “One of the most interesting museums in the world,” I’d have to agree. Hands-on, interactive, and accessible to young and old, the privately-funded DDR Museum provides a glimpse into the daily life of a former East German (Deutsche Demokratische Republik=DDR). You’ll open cabinets and drawers, listen to recordings, and handle vintage artifacts during your visit, truly causing you to enter the exhibit. The DDR Museum would be a WONDERFUL learning opportunity for school-age children, but I was absolutely fascinated. Another plus? It’s small compared to most museums. First opened in 1894, the building suffered a fire in 1933 and fell into further disrepair post-WWII. After Reunification, the Reichstag was renovated and re-opened in 1999 to house Germany’s parliament. A large glass dome was added that offers a 360-degree view of the surrounding Berlin cityscape, but you have to register to visit. We didn’t; here’s the link so you can! I think it’s probably worth it. It was pouring rain when we arrived at Berliner Dom AND there was a service going on; so we saw it, appreciated it, and moved on quickly. The building has seen several incarnations both in denomination and architecture, but it’s impressive and beautiful and worth your time to explore. And on a sunny day, I bet the pictures turn out better :). The rear view is as love as Berlin Cathedral’s front view. We’re SMILING because the rain finally stopped!! Perfect photo op with Berliner Dom in the distance. Retail and restaurants in a modern setting, the Sony Center at Potsdamer Platz was within walking distance of our hotel. We didn’t spend a lot of time there because we were interested in a more historical tour of Berlin, but it was nice to find a spot to grab morning coffee and it gave us our last meal heading out of town at Billy Wilder’s. If we had a few more days, I’m sure we would’ve learned it inside out. A future Berlin post will include street scenes that didn’t fit my top ten and the top places I’d like to visit if we ever have opportunity to return. But next up, I think we’ll take a look at more travel tips, and then……I’m in the mood for love. Paris anyone? ?